As tablets are becoming mainstream personal and business devices that replace laptops in some situations, people are looking for ways to use their tablets with the accessories they already own, like keyboards and printers. Many of these accessories connect using USB. That can pose a problem for iPad owners because there's one important element missing from the iPad: There's no USB port (on many models; the latest actually do have USB, as we'll see). Some recent iPad models have a Lightning port to connect to accessories. Older models have a 30-pin Dock Connector port for accessories which works the same way as the other ports, but requires a different connector. Tablets from many other companies have built-in USB ports to connect to accessories, but not the iPad. Apple does this intentionally, to keep the iPad simple to use and elegantly designed. Everyone likes well-designed products, but trading looks for functionality may not be worth it for some people. So does this mean that choosing to use an iPad is also choosing to not use USB devices? Nope! You can use a lot of USB devices with the iPad if you have the right accessory. Here's what you need to know. The 2018 and newer iPad Pro models (with 11- and 12.9-inch screens) actually do have a USB port. They're the first iPads that do. These models sport the next-generation USB-C port at the bottom and allow you to connect any USB-C device that's iPad-compatible to your iPad Pro. With these models, the problem of connecting USB devices to the iPad is solved. But it's only solved for USB-C accessories. If you've got an older USB device that you want to use with these models, you need an adapter. Apple offers a US$19 USB-C to USB Adapter. Just plug your old USB devices into this adapter and then plug the adapter into the iPad's USB-C port and you'll be good to go. If you have a 4th generation iPad or newer, any model of the iPad Air, any model of the iPad Pro released before late 2018, or any model of the iPad mini, you'll need Apple's Lightning to USB Camera Adapter to use USB devices. You can connect the adapter cable to the Lightning port at the bottom of the iPad, then connect a USB accessory to the other end of the cable. This accessory is designed to connect digital cameras to the iPad to import photos and videos, but that’s not all it does. You can also connect other USB accessories like keyboards, microphones, and printers. Not every USB accessory works with this adapter. The iPad needs to support it. However, many accessories work with the iPad and you'll vastly expand the iPad's options for accessories with it. You’ve got options even if you have an older iPad model with the wider 30-pin Dock Connector. In that case, you just need a Dock Connector to USB adapter instead of the Lightning to USB Camera Adapter. There are lots of options on the market, but shop around and check reviews before buying to make sure you get something of good quality and wide compatibility. Like with the Camera Adapter, this cable plugs into to the port on the bottom of your iPad and lets you connect USB accessories. 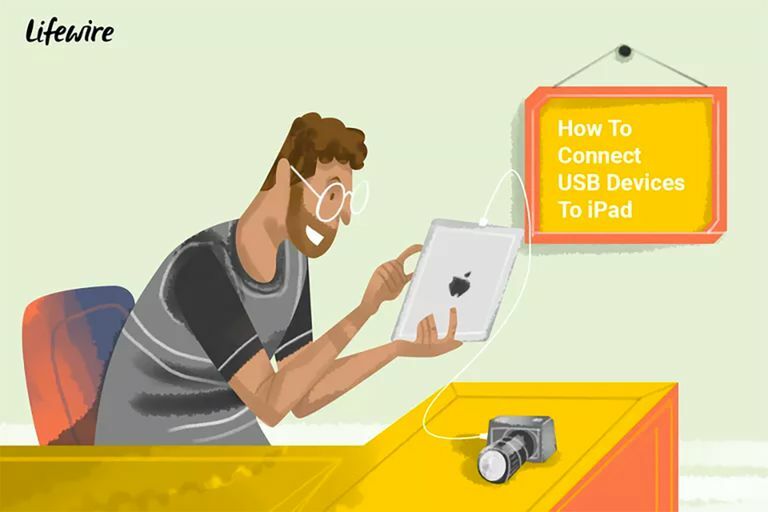 USB isn't the only way to connect accessories and other devices to an iPad. There are many wireless features built into the iOS that let you interact with other devices. Not every accessory supports these features, so you may need to buy some new devices if you want to take advantage of these features. AirDrop: This is an Apple technology that is available on devices running iOS 7.0 and higher. It lets you wirelessly transfer files between iPhones, iPads, and Macs. AirPlay: Apple's technology for streaming audio and video from an iPad to speakers and screens. If you have compatible accessories, AirPlay lets you stream audio and video, as well as mirror your iPad's screen on your TV via the Apple TV. AirPrint: This is Apple's solution for printing from iPads that don't have USB devices connected to them. Support for this wireless technology is built into iOS, but you'll need an AirPrint-compatible printer to use it. Bluetooth: This short-range wireless networking standard can be used for communicating with keyboards, headphones, microphones, iPads and similar devices. It's an industry standard, so you'll find the widest rage of options here.